Gareth Bainbridge heads home the equaliser for North Shields just ten minutes from the end of the FA Vase final at Wembley. Picture by Ian Warde. North Shields won the FA Vase the hard way, coming from behind to lift the trophy at Wembley after taking the final to extra time. 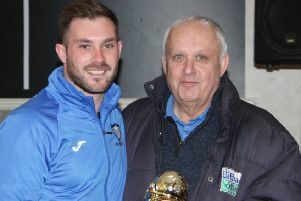 Opponents Glossop North End had been in the final in 2009 while knocked out former winners Dunston UTS this year and won the North West Counties Premier League by a country mile. Shields survived an early scare thanks to a brave Jack Donnison block as the Hillmen adapted to the ‘occasion’ quicker than the tentative lads from Tyneside. Kelvin Lugsden was thwarted by Chris Bannon’s fine save then centre forward Tom Bailey found the roof of the net with a header and captain Dave Young hooked over. Shields stood firm but it took until the 42nd minute that Glossop custodian Greg Hall was tested – and he excelled to keep out a great Gareth Bainbridge strike. A cagey first period erupted soon after the resumption with Fenton’s half time talk having the desired effect. Ben Richardson was so unlucky not to open the scoring with an absolute beauty that rattled the crossbar with Hall helpless. Then Dean Holmes, who had courageously started despite a nasty injury, set up the stylish Michael McKeown whose left foot belter propelled Hall to finger tip to safety. Against the run of play on 54 minutes the Glossop fans had something to shout about as Shields hesitated following a corner with Lugsden driving the ball across the six yard box for Bailey to slide in – the first time the Robins had been behind in their FA Vase run. The resolute and impeccable Shields rearguard had been breached and it took a while as Shields reshuffled part through injury, part tactical to find a way back. Effort though was there in abundance and just ten minutes from the whistle the red part of the ground erupted. McKeown swung over a delicious corner and that man Bainbridge toasted his 103rd Shields goal with a dazzling header. Either side could have nicked it in normal time but five minutes into extra time and Shields had. Breathtaking pace from man of the match Denver Morris and a teasing cross was slickly knocked in by sub Adam Forster in Alan Shearer style and what a moment to savour for the young Shields midfield dynamo. That sparked a Fenton sprint to join the congratulations. The Robins still had much to do to preserve their advantage. Glossop’s Young was unable to complete the afternoon after suffering a head injury at the midway point of extra time and with all substitutes used the Derbyshire outfit were down to ten men. Shields were not going to let this one slip after all their stirring efforts with Kevin Hughes and John Parker again so impressive at the heart of defence with John Grey making the tackle of the day in the nervy final seconds. Then it was all over – and North Shields are still coming to terms with the enormity of their achievement.